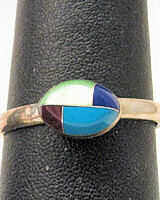 This sterling silver overlay ring has a four inlaid natural medicine stones. The ring face is about 3/8" x 1/4" (1 cm x 0.6 cm) and the band is about 1/16" wide (0.2 cm). This ring is adjustible, so one size fits most. Hand Crafted -- Only 1 available! However, this ring can be combined with other rings in this category that are the same price to reach deeper discount levels. Our shopping cart will automatically recomputed prices when a new discount level is reached.